1. ABS plastic body, in Japanese quality, durable to use. 2. Bright colors wrapped with the body, to attract the fishes effectively. 5. Durable enough stainless steel hook and double fan-shaped design, not easy to unhook. 6. Many colors and weights can be selected, application for any weather and any territorial waters layers. 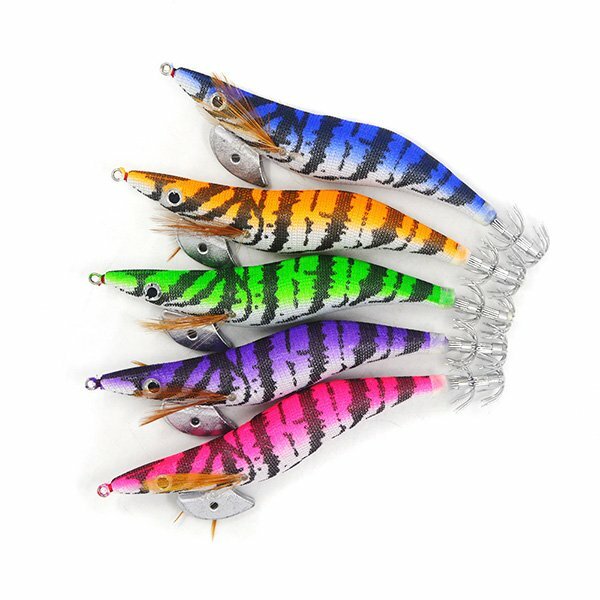 We produce the quality Squid jigs, including different molds, colors, weights, and sizes; such as luminous body and tail design, sparkle cloth cover, LED light inside design, 3D big eyes, single or double fan-shape hooks and so on. The squid jigs is a great fishing tool for saltwater fishing, such as squid, cuttlefish and octopus catching. We supply the squid jigs with Japanese quality, lifelike real shrimp to attract the fishes. 1, We are a manufacturer and we can supply OEM service, just send us your request. The sample will be sent you to confirm within 15 days. 4, We have a large quantity of inventory, don’t worry about the delivery time. 6, If there is any quality problem after you received the squid jigs, just contact our sales, you can return back the squid jigs or exchange it. 1, If we have stock, we will delivery the good immediately after received your payment. 2, If you need to customize, General around 10-45 working days after sample confirmed, due to the order quantity. 1, Airplane shipping is faster and more convenient, generally, 4 to 7 days can arrive to your door. 2, Sea shipping is cheaper, it is adapted when the goods heavy enough. Whichever shipping options will be adopted, we will send you a clear shipping cost list. Kmucutie fishing tackle company is a professional manufacturer to produce a series of fishing lures, Our main products are Squid jig , Lead jigs, Trolling lures, Bucktail jigs, Fishing rods, Fishing Reels. These products are marketed and sold throughout the United States, Australia, Japan, New Zealand, Mexico, Brazil, Southeast Asia, and countries around the world. We supply you the largest widest selection of fishing lures with excellent quality, competitive price, and the best customer service. The squid jigs are more and more popular for fishing lovers. In fact, fishing for squid is not difficult. If you want to catch squid, you still need to understand well the habit of the squid. The squid is a kind of soft body ocean life with the conical shape, pale body, pale brown spots, large head,10 feet in front, and very good vision. Often in groups of oceans that are about 20 meters deep. Like to hide in the reef seams. The squid-like to eat shrimp, small fish, shells. The squid jigs are more economical, There is the ordinary and luminous type. According to the seasons, the squid jigs size is different. Generally, from June to September, you can choose the 2.5# and 3.0# squid jigs. From October to next year February, you can choose the 3.0# and 3.5# squid jigs. When is water depth or water flow is large, you can wrap some lead wire or tin wire on the squid jigs. The more sparkle on the surface to better fishing. The good catching colors include yellow, orange, red, blue, green.